Hanoi (VNA) – Vietnam has made significant efforts to contribute to the development of Francophone community as well as the promotion of the International Organisation of La Francophonie (OIF)’s image in the region. 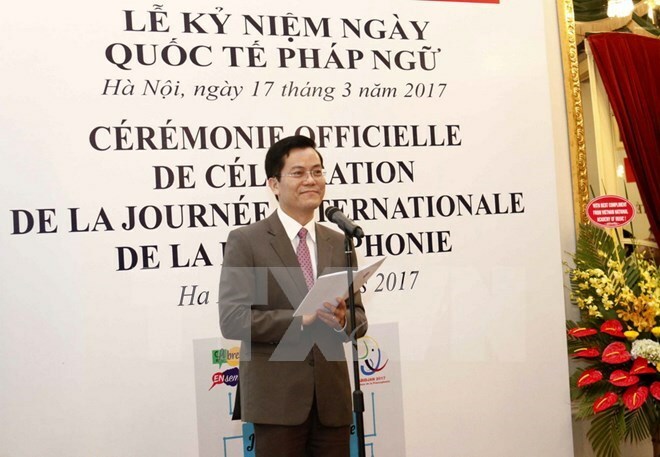 Deputy Foreign Minister Ha Kim Ngoc made the statement at a ceremony in Hanoi on March 17 to mark the International Francophone Day (March 20), which was jointly held by the Foreign Ministry and the OIF. Speaking highly of the stellar achievements made by the Francophone community in tackling global challenges like security and development, Ngoc affirmed that Vietnam will continue to work hard to consolidate solidarity and collaboration among the community for global peace, stability and sustainable development. Vietnam will be a bridge to promote the French language in the Asia-Pacific, Ngoc added. For his part, OIF Director for the Asia-Pacific Eric Normand Thibeault expressed his delight at the sound collaboration between Vietnam and the OIF in 2016, particularly in politics, which is reflected in the Vietnam visit by the OIF Secretary General and President Tran Dai Quang’s attendance of the 16th Francophone Summit in Madagascar during the year. He asserted that the OIF attaches importance to cooperation projects with Vietnam, especially those on teaching the French language and teaching in French, promoting culture diversification, applying digital technology, preparing for Vietnam’s participation in the UN’s peace-keeping force and responding to climate change. At the event, Nguyen Khanh Huyen, a lecturer of Hanoi Architecture University, and Ho Thi Minh Trang from Da Nang were presented with awards for their contributions to promote collaboration relations between Vietnam and the OIF. Vietnam was among founding countries of the OIF in 1970. Over the years, the OIF has maintained active cooperation with Vietnam including the exchange of training and technical expertise in a number of fields.